Don't be fooled by the moderately cool weather Friday morning -- be sure to bundle up! It will be sunny and in the 40s until about 5 p.m., when temperatures are expected to drop into the 30s. By midnight, expect temperatures to drop below freezing. The record low for Nov. 10 in D.C. is 26 degrees. Saturday morning, temperatures will likely hover just above record lows. Saturday afternoon, it will be sunny and chilly with highs near 40. But the winds die down Saturday. Sunday, clouds may roll into the area but it will be a little warmer with temperatures near 50. It may rain later late Sunday and early Monday, but chances remain low. With the possibility of near record-low temperatures, you may want to spend some time winterizing this weekend. 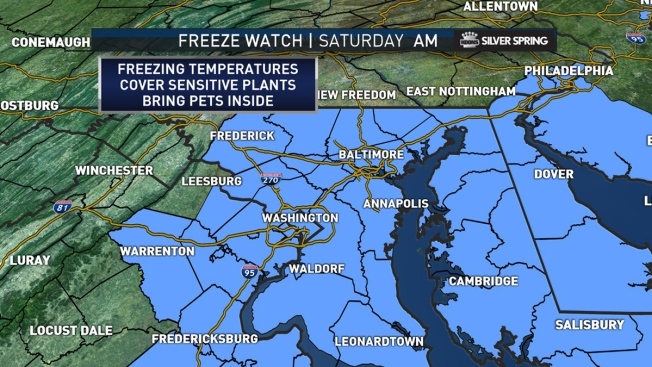 News4 has 12 ways you can prepare your home, garden and car for more cold temperatures.